In the continuing trend in Hollywood to recreate my 80s childhood. I must say that I am definitely going to watch this movie when it comes out. Just a question: why is the Baroness figured very prominently in this trailer? Could this be the end of movies as we know it? The music industry has been hit hard by the digital age and the tv and movie industry are still hanging on but it seems to be a losing battle against super fast broadband connections. The only ones that seem to be having a good year are videogames. Halo 3, the big winner of 2007 in terms of sales outsold the entire Hollywood lineup in terms of money earned and the latest version of Grand Theft Auto seems to have done the same. The New York Times reports that in a span of one week, the franchise has taken home $500M with 3.6M copies sold on the first day. Sure it’s quite a wait between sequels but the overhead, depending on the franchise is either equal or smaller than that of a major motion picture. Until pirates figure out how to completely fool game consoles, it looks like videogames will be the main choice of entertainment in this generation. I went to the mall this weekend and while waiting at the ATM near the cinemas this was next to it. 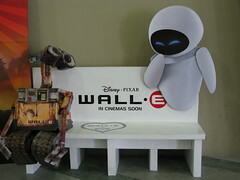 At first glance it looks like the same bench at Pixar Studios, but this one’s made out cardboard. It looks like they just got it up this weekend. Anyhoo I’m making sure that I’ll be watching this movie when it comes out. Just a note, this is the first Pixar full length film where a voice actor was not hired for the lead. This should be very facinating.